This is not a bad film. But it is calm, and a step out for Peckinpah. Rarely does he give it to you straight: his work has a bracing, subconscious effect — a pulse. Sprung it may be, but his technique is only part of the story. The form — the action film, or in the case of Garrett, the western — gives it meaning. The synaptic rhythms, the zero-sum pride of his characters, are key. But Peckinpah’s triumph is the romanticization of a two-bit world in which glory is rot and vultures hang. The genre fits. The landscape is primitive, open and curt, men of bounds fight men without roots, and the law is mutable. Vulgar as all get out, Peckinpah fired the western for the modern eye.1 He was a boozy boor, and lovable; he was able to transmute his soul to the screen, warts and all. His films are middle-fingered farewells. Their humor sets them apart, and keeps them from being nihilistic and revisionist. (Not only does he put too much of himself into them, he loves the genre too much.) Macho corn is the staple. Some of the films are rich in testimony. Others are like a crafty dervish. All of them are paintings of pain. 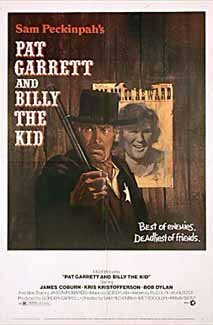 For its lack of spirit, Pat Garrett And Billy The Kid is odd. It’s too understated, too somber and drained of energy; the melancholy is all there is. Nothing is strained, but you wish it had been. And yet. The materials are such that the film works in spite of itself. It spools in a stupor that is right for its elegiac tone. Sam is in the film, but he idles. The tone is steady and rich, but resigned, as if he leaned on the externals — the talent — to make his drunken sigh a reality. They have to feed his muse. The film has no flurry, no motive or means for excitement. It is a dream for the numb. James Coburn is the heart of the film. As Garrett, the outlaw-turned-sheriff who goes after Billy (Kris Kristofferson), he is tired and tragic. He turns Garrett into Peckinpah: grizzled and gaunt, with a steely pair of eyes. There is a kind of majesty to it — the authority of the slow burn. Haunted, and less than honorable, he is Presence, and he coats the film with it. Kristofferson is a blip. He registers barely, but for the character actors in the film, his cool vacuity is a foil — the non-presence does not sink the inflated myth. The Kid is a vessel, a stick of symbolism. To it, Garrett would like to martyr a free-peace holy-hood at the hands of greedy straights and capitalist dads. So…Kristofferson is OK, but he is nothing more than a pair of jeans and a beer gut — a smug hippie smile. Garrett is the only principal we can identify with. He knows his contradictions. The act of “selling out” to the cattle barons is a mercenary one. Presumably, it is all that separates the lawless from the lawful. But it does not merit the Christ-like hemming of the role of the Kid, an all too obvious choice. Because there is nothing at stake, the final showdown is a mismatch. We pray that Peckinpah will add some kind of twist, but he does not. The violence? “Bloody Sam” was the Picasso of violence. From a panoply of views he showed it, sometimes in a single beat. The slow-mo kill shot (as it came to be known) was a snap-aesthetic of beauty and horror. Bursts of action were ambivalent — deeply ambivalent. In Garrett, the violence is solemnized. Death is a given; it is perfunctory. None of the gunfights stun you. They just sort of fade in your head. Look at the duel between Alamosa Bill (Jack Elam) and the Kid. It is an empty ritual. Alamosa’s time has come, and he knows it. No man can run from the choices he has made. Like Sam’s direction, Bob Dylan’s soundtrack is texture to a T. It is Dylan at his most economic. (A bad joke, he also plays the role of Alias.) The soundtrack hangs in the air like sawdust. There is no dynamism. It’s a trick of shading, a ray of sadness. Garrett shows just how much Dylan (and Peckinpah) you can take out and still have. The basic impression the film leaves is one of drifting. Everyone in the movie drifts. From Pat’s posse to Billy’s band, they drag on the scenery. And the narrative drifts, too: There is no plot. There is only a series of vignettes. After Garrett was recut by MGM, Sam made Bring Me The Head Of Alfredo Garcia (1974), a pitch-black cry of anger, and arguably his best film. The restored Garrett is a little weird around the edges. (Six editors worked on it.) It is a piecemeal and poetic film. And it stays with you. 1Sergio Leone, the famous director of spaghetti westerns, did the same. Like Peckinpah, he saw the hero’s place as a bed for bastards. But he was more interested in myth. 2The Missouri Breaks (1976) is a close second.